You know that your work is tough on your body. So you stretch out your back, wear low-heeled shoes and take the occasional break to sit down. But are you still standing on a hard floor or ordinary mat? The innovators at Smart Step Salon and Spa want a word with you! Two words, actually: standing solutions. Salon pros do their job by standing all day while reaching, lifting and bending. A sore back and legs shouldn’t be the price of working at the craft you love, Bouzide maintains. One way to avoid the pain is to stand on a premium-quality mat. In mats, construction matters. With all manufacturing facilities in the U.S. and shipping out of St. Louis, Missouri, Smart Step produces mats made of pure polyurethane, with no cheap glue, foam, plasticizers, latex or PVC. These mats' one-piece construction means there’s no bubbling, delaminating, curled-up edges or separated layers. A non-stick bottom prevents the mat from sliding around. “We’re the only company that invests the money to add a clear-coat polyurethane finish,” Bouzide says. “It’s easy to sweep and clean the mats, dramatically helping to prevent hair color stains.” The mats come with a five-year warranty. According to Bouzide, the most common reaction among stylists who start working on the mats is that they wish they’d known about Smart Step years earlier. He agrees that the earlier you get your feet on a good mat, the better. Smart Step has been providing its Premium Standing Solutions for more than 20 years in industries ranging from housewares and medical to industrial and automotive. 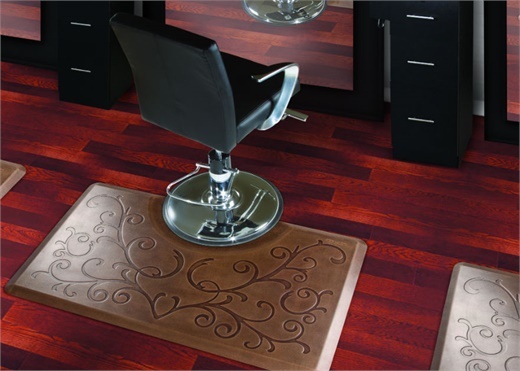 Two years ago Smart Step “stepped up” the beauty in its salon and spa division by adding a Designer Series of mats in colors and textures as an alternative to its standard black mats. A variety of shape options includes a custom-sized mat strip that provides a continuous mat from station to station. With CosmoProf/Beauty Systems Group as its beauty industry distributor and exhibiting at many CosmoProf shows, Step also works with many authorized premium independent distributions nationwide. By late this year, Smart Step plans to introduce to the beauty industry its Klogs shoes, giving stylists another way to prevent injury and strain.